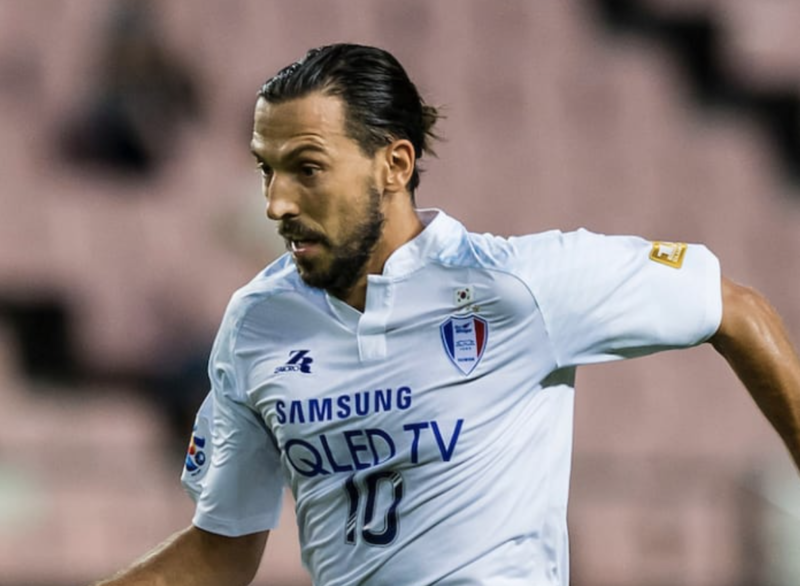 August 30 – Two goals from Dejan Damjanovic (pictured) helped South Korea’s Suwon Samsung Bluewings edge closer to a place in the last four of this season’s Asian Football Confederation (AFC) Champions League following a 3-0 win at domestic rivals Jeonbuk Hyundai Motors in the first leg of their quarter-final clash on Wednesday. Suwon stunned the current K League leaders with three late goals to claim a victory made even more remarkable by the fact that head coach Seo Jung-won had resigned only 24 hours earlier. The visitors were, however, made to wait for their opening goal. Bosnia and Herzegovina import Elvis Saric broke down the left and his perfectly weighted delivery was expertly turned in by Damjanovic at the far post on 75 minutes. Suwon duly doubled their advantage just seven minutes later, Damjanovic controlling a knock-down from Lee Jong-sung before turning and firing home a left-footed shot from 18 yards. Substitute Han Eui-gwon added further gloss to the scoreline when he rose to head home the impressive Saric’s cross from the right in the 85th minute. Damjanovic’s brace took the Montenegrin’s AFC Champions League haul to 34 – just two short of the record tally of 36 currently held by Jeonbuk star Lee Dong-gook. Jeonbuk now head to Suwon for the second leg in three weeks with a mountain to climb if they are to make it to the semi-finals. In the competition’s earlier quarter-finals, Qatar’s Al Sadd won 3-1 away at Esteghlal, while both Al Duhail from Qatar and Japanese side Kashima Antlers also registered first leg successes.